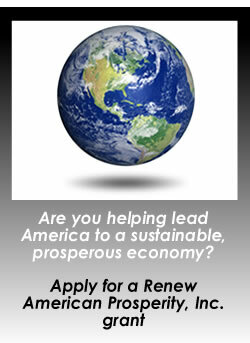 Renew American Prosperity, Inc. (“Renew American Prosperity”) is a non-profit advocacy organization founded to support organizations, individuals and campaigns that gather and publicize information about the real costs of fossil fuel, extractive and polluting industries; as well as their various spokespeople, allies, activities and policy impacts on Americans. As a 501(c)(4) organization, Renew American Prosperity is committed to a greater degree of accountability for these industries – and greater transparency from the elected officials and opinion makers with financial ties to those industries. Renew American Prosperity is the place where people who are supportive of clean energy but don’t work in the industry and those who do work in clean economy sectors can come together to support the individuals and organizations leading our nation into a sustainable future. Through the research and public communications of those it supports, Renew American Prosperity wants to increase and enhance the public dialogue about what a more sustainable economy can and should be. Research: Renew American Prosperity will support the production and dissemination of research on polluting industries, the subsidies that they enjoy and the relationships between them and government officials and media pundits — particularly where money and transparency are concerned. Grassroots and Media: Renew American Prosperity will conduct grassroots and media initiatives, through popular media outreach, public and private seminars and presentations, self-published informational materials, information posts on the public domain, and outreach events with members and leaders of various professional and advocacy communities. Renew America will direct these efforts toward increasing public awareness of the facts surrounding polluting industries and encouraging Americans to support a shift in the policy environment toward a sustainable economy.